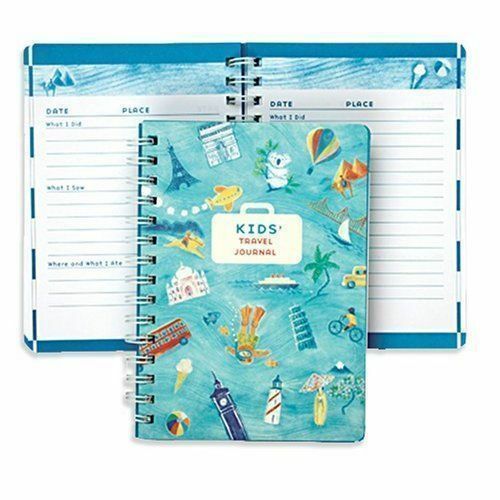 On your next family vacation, bring along the Kid's Travel Journal for your young ones,so they can write down their experiences and memories as you travel along. My only complaint about this novel pint-sized travel journal packed with 128 interactive pages for pint-sized travelers is that I did not have the opportunity to travel with something like this when I was younger! A unique blend of a diary, trip planner, and games focused on learning about the world, all presented in an array of vibrant colors, this is the perfect gift to keep your child entertained and informed as you embark on your next family vacation. The journal begins “Before I Go,” with a group of pages reserved for friends’ addresses (essential for postcards! ), a packing list, a suggested reading list, some spaces for children to do some research on where they are traveling and the history behind where they are going. Interspersed among the journal’s various sections are assorted puzzles perfect for entertainment on long plane or car rides. Also, there are spaces for reflection along the way and even an address book in case your little traveler makes some friends along the way. Plus, the journal’s flexible binding is ideal for on-the-go use. This is definitely something that kids will not only enjoy, but keep forever as a token of their travels.